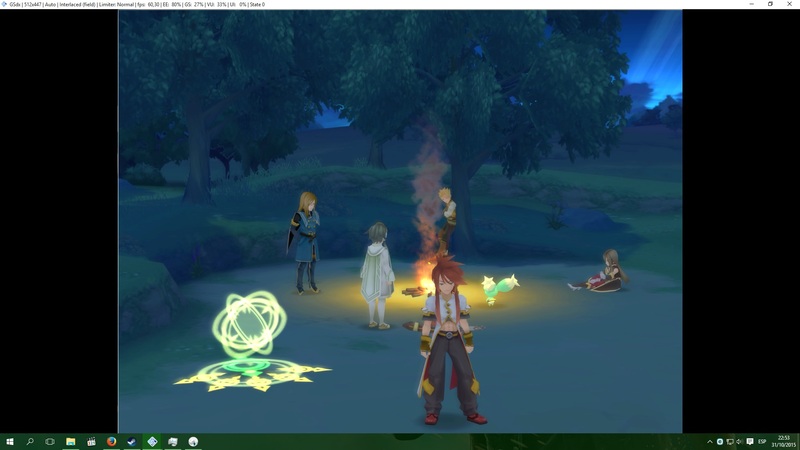 Tales of the Abyss, sound/graphics issues. I'm trying to play Tales of the Abyss, I think I resolved the audio and black screen after battle problems, but! there is like a white shadow behind the objects, I guess that is not correct and it's very annoying, so I've been disabling and enabling some options but the problem still. EDIT: NOW I resolved the audio and black screen after battle problems. Hmm. Plenty wrong with your game. For one, it's stretched, so the widescreen hack is not enabled. For two, can you please tell us your PC specs? You shouldn't mess with speedhacks besides the check box ones. Make sure you have Half-Pixel off-set enabled in HW hacks to get rid of GHosting. As for audio issues, your FPS is below 60, so you will be having those regardless. Disable allow 8-bit textures. Try using OpenGL mode, I've found it emulates better and takes less resources. (11-01-2015, 04:03 AM)Mkilbride Wrote: For one, it's stretched, so the widescreen hack is not enabled. (11-01-2015, 04:03 AM)Mkilbride Wrote: For two, can you please tell us your PC specs? You shouldn't mess with speedhacks besides the check box ones. (11-01-2015, 04:03 AM)Mkilbride Wrote: Make sure you have Half-Pixel off-set enabled in HW hacks to get rid of GHosting. (11-01-2015, 04:03 AM)Mkilbride Wrote: As for audio issues, your FPS is below 60, so you will be having those regardless. Disable allow 8-bit textures. Try using OpenGL mode, I've found it emulates better and takes less resources. My FPS are between 58-61, when I clicked the plugin options to take the picture they drop. My audio issues was just the Effects, they get muted, the Music and Voices are fine, just the effects get muted. But I solved that disabling the speehack that I mark in the picture. Ohh!! Really thanks!! Enabling "Half-Pixel off-set" in HW hacks solved my problem!! ^^ thanks again. Glad it fixed it for you. As for wide-screen, you can do 16:9 by enabling Widescreen Patches. If it is the undub, I placed a custom pnach below for it to drop into your cheats_ws folder. Drop the pnach below in your cheats_ws folder, inside the PCSX2 folder. Make sure "Enable Widescreen patches" is checked on the PCSX2 System Menu. You should have progressive scan, 16:9, non-streched gameplay. Your system is abit weak, but ToA isn't that demanding of a game anyways, at least I think. Maybe if you can OC your processor a bit, you might be able to achieve 60FPS Constant. His is the Spanish translation apparently. The CRC is B6B5A6DC. Oh hmm. So a PAL release? Is there a PAL pnatch? Anyways, can just rename my pnach to that CRC and all be good. No reason to waste 16:9 real estate when you can have it. I think it's the NTSC version, but with a spanish translation patch applied to it. Much like the undub version, but for spanish instead. Yeah, the serial indicates it's NTSC. And yeah, just renaming it will do just fine. My game isn't the Undub, it's just the USA version with a spanish patch, the guys who made the translation say their patch runs perfectly with the USA version, and maybe the Undub version will have some problems. So I downloaded the: 045D77E9.pnach and renamed to B6B5A6DC.pnach, put it in cheats_ws folder and chaked "Enable Widescreen patches"
And now I can't pass after the "SONY COMPUTER ENTERTAINMET"... black screen, and with the fast run it's another black screen. I get off the .pnach and the game runs again anything to do to play at 16:9? Uh. That's very strange. Hmm. I know nothing of the Spanish version, but renaming the pnach should cause no issues...outside my area of expertise.